What, if anything, do Honeybells have to do with hydrology? After all, citrus and water don’t seem like a natural fit. 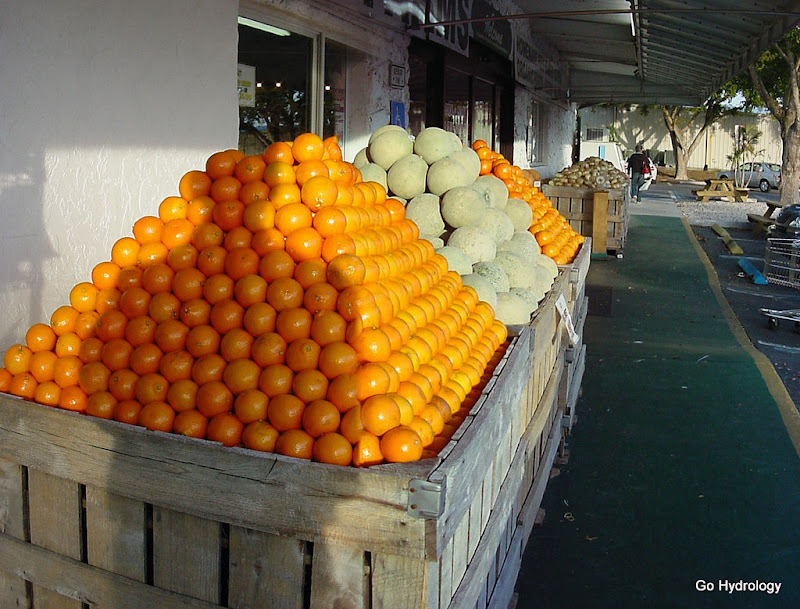 Honeybells are probably the most prized citrus of all the Florida orange crop – in part because of their delectable taste and also because they are seasonally quite rare: peak Honeybell season last just a few weeks in January. However, these globules of orange gold can be stored through February, and one year I even saw them on display at a local grocer in March. But that’s rare. The best ones in their purest form are found fresh off the vine near the start of the year. Gradually over time the Valencias move in on the shelf. They are also very juicy but more pulpy, have many more seeds and aren’t anywhere near as sweet. Winter is over and spring has begun. It’s a sad feeling for us in Florida to see the Honeybells go. That means winter – if in fact we have one – is gone too, and that summer-like temperatures are on their way. So enjoy them while we still have them – both the Honeybells and the cooler days.